RANDI: (Pointing a finger, accusatory) Oh. It's You. THE DAILY RANDI: (She finishes Text Messaging Totally Awesome Boyfriend nee Totally Awesome New Boy and quickly puts away her T-Mobile Sidekick.) Hey. Hi. What's up? RANDI: Maybe I should be asking You that. RANDI: Oh, please. Ever since you’ve met your Totally Awesome BOYFRIEND, you hardly Blog anymore. It is like you Forgot All About Us. 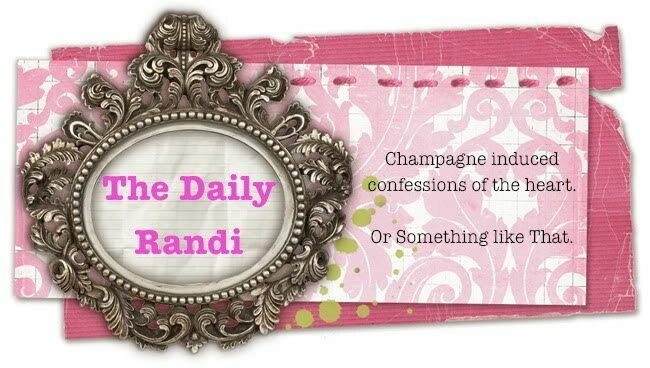 THE DAILY RANDI: What? What are you talking about? I am Blogging right now! RANDI: Ha. First time in Almost A Week. THE DAILY RANDI: Hey! That’s not fair. It was A Holiday! THE DAILY RANDI: So, On Holidays I Never Blog. I always take The Day off. RANDI: Oh, okay. So, Your Not Blogging in Nearly Four Days had nothing to do with You Not Being Home? And being at Totally Awesome Boyfriend's Place all weekend? THE DAILY RANDI: No! No! What are you talking about? I was totally thinking about You! I Wanted To Blog! I was just, Busy. RANDI: Busy with Totally Awesome Boyfriend? THE DAILY RANDI: Well, sure, but that is Not The Reason. Listen. I just – Well, I just have Other Things On My Mind right now. RANDI: Like, Totally Awesome BOYFRIEND? Right? Am I Right or Am I Right? THE DAILY RANDI: Well, um, okay. You’re Right. But, It is just So Hard To Focus! And I don't want to write Only About Him and how Totally Awesome He Is! I want to write about Other Things! RANDI: (Shaking her head.) Exactly My Point. THE DAILY RANDI: Well, put yourself in My Shoes for just a second! RANDI: Are they Marc Jacobs? THE DAILY RANDI: Of course! RANDI: Wait. Do I get to wear your Just Purchased And Totally Fabulous Rachel Palley Wrap Dress, if I Am In Your Shoes, too? Because it So Matches The Shoes. THE DAILY RANDI: Um, sure. THE DAILY RANDI: The Dress is Nice, right? RANDI: Oh, it is Gorgeous! I am So Jealous! HEY! Wait a minute! You got me off on A Tangent! I stopped thinking about Totally Awesome Boyfriend for One Whole Second! RANDI: Exactly! Hee-hee. I knew My Trick would work! THE DAILY RANDI: Yeah. Well, sure. Except that you forgot that I probably Just Purchased The Totally Fabulous Rachel Palley Wrap Dress to Wear Out With Totally Awesome Boyfriend! A-Ha!! Gotcha! THE DAILY RANDI: Yeah. Oh. RANDI: So… What Is This? Are you going to Try And Pass This Off As A Column Then? This doesn't exactly count as a Blog Post now. THE DAILY RANDI: Well, I mean, I am Posting It. So, it should Count! RANDI: But, it is not A Story! It is Not Your Usual Silly Daily Randi Tale that I look for here. It is just A Stupid Imaginary Scene between Your Alter Ego and Yourself. THE DAILY RANDI: Yeah, well, it’s All I Got In Me Tonight. RANDI: Fine. But, just make sure you make up for it Tomorrow Night. I want to hear all about How You Have Gone Through Your Entire Dating Wardrobe Already and are now being Forced To Repeat or Retail. THE DAILY RANDI: Hey! That’s A Great Idea! RANDI: Yeah, I Know. And I Can’t Wait To Read All About It. Tomorrow. THE DAILY RANDI: It’s A Deal. Now Give Me Back My Dress And Shoes, please. RANDI: (Reluctantly handing over The Fabulous Designer Goods.) Grrrr. I agree. Some of us still-perpetually-single girls need some entertainment and you are NOT holding up your end of the bargain! I'm jealous that Totally Awesome Boyfriend is stealing you away from us, Your Adoring Audience. I'm glad Randi had the guts to say what we all were thinking. Heh. Congrats on the upgrade from "Totally Awesome New Boy" to "Totally Awesome Boyfriend."